Some of the people who receive this CASE Weekly Update are not members of CEC and CASE. The vast majority of our readership are local special education administrators. CASE is your professional organization. We are working frantically to make sure you have all the information you need to do your job well. We are diligent in advocating for you, your teachers, your students and your parents. We are constantly trying to "impact" the field in a positive way and we do all of this on a shoe string budget. We do it with the help of many dedicated volunteers — many of you. 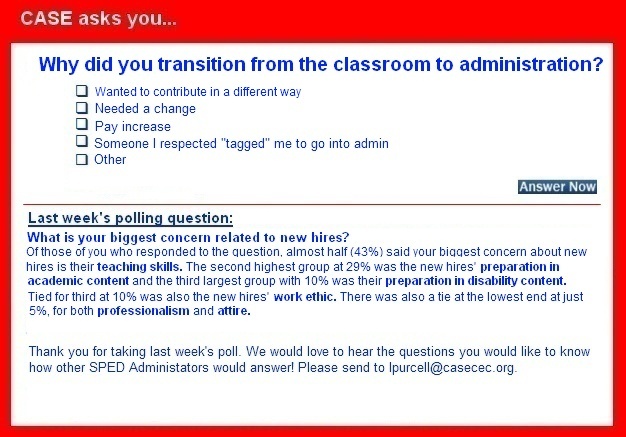 CEC is the premier organization for special education teachers — the people most of you supervise. The information I receive through Teaching Exceptional Children (TEC) alone is in my opinion worth the dues of CEC — when I was an Assistant Superintendent, my teachers must have had some sort of "homing" device implanted in me without my knowledge because it didn't matter which of the 33 schools I would drop in on each day, ALL the sped teachers in the building knew when I arrived. And they always had at least one "problem" they wanted me to solve! The articles in the TEC helped me "help" them. For the next two days, you can join CEC and CASE at a $10 discount on the CEC membership and receive a free copy of our most recent Lucky 21 — #6 Personnel Recruitment and Retention. But you have to use the special form and it has to be sent in or post marked by July 10 for the discount to be honored. Click here to download the special CEC membership Form. We hope you will look at the Top Ten Reasons and decide you too want to belong to CASE/CEC! 10. Keep Up-to-date on special education issues. 1. IMPROVE THE EDUCATIONAL SUCCESS OF ALL STUDENTS! Isn't that why you became a special education administrator in the first place? "Never doubt that a small group of thoughtful committed citizens can change the world; indeed, it's the only thing that ever does." Margaret Mead. C8 Sciences, one of the fastest growing brain research companies in the world, is seeking an Inside Sales Consultant to help implement our researched based programs into the education and healthcare markets. This position has six figure earnings potential, full benefit package, extensive training program and great working culture for the right candidate. $630 Million. That's the amount special education/early intervention programs were cut by as a result of sequestration. Now, as Congress begins its process of setting the annual funding levels for all education programs, including IDEA's early intervention and special education programs, CEC is calling on lawmakers to increase the investment in special/gifted education programs. In 2011, the U.S. Department of Education said that schools no longer had to get parental consent each time it accessed public benefits or public insurance — schools must seek consent just once when a service begins and annually thereafter, as long as they are provided a detailed notice about what they are signing and understand they can revoke consent at anytime. As public schools, charter schools must comply with federal special education laws. But while the number of students attending charter schools has skyrocketed in the last decade — 1.8 million students now attend charters — the percentage of students with disabilities attending such schools continues to be below the national average, according to a new report by the Center for Research on Education Outcomes at Stanford University. Students with disabilities will be able to use read-aloud accommodations on the English/language arts portion of the common core tests, with no requirement that they be virtually unable to read printed text or be at the beginning stages of learning to decode, according to an accommodations manual. A new brain imaging study of dyslexia shows that differences in the visual system do not cause the disorder, but instead are likely a consequence. A common reading disorder goes undiagnosed until it becomes problematic, according to the results of five years of study by researchers at Vanderbilt's Peabody College of education and human development in collaboration with the Kennedy Krieger Institute/Johns Hopkins School of Medicine. For students with emotional or behavioral disabilities, navigating the transition from high school to a job or to college can be more daunting than it is even for other students with special needs. Research suggests that these students have no more trouble than other students finding work after leaving school, but that they often lack the "soft skills" required to stick with employment for the long term. America's testing culture: How did we get here? For the last three decades, our schools have been shaped by so-called accountability measures. Standardized tests were meant to make sure students were learning, and schools and teachers were held responsible if kids did not meet the standards. But lately, criticism of the accountability movement and its consequences, intended and otherwise, has reached a crescendo. Parents are pushing back against the testing culture (too much time spent on preparation, testing, and test analysis and not enough on deeper learning). The New York Times recently reported that attention-deficit/hyperactivity disorder is being diagnosed in "nearly 1 in 5 high school-age boys in the United States and 11 percent of school-age children." The article's author commented that this is a 16 percent increase since 2007 and a 41 percent increase over the past decade. The article then immediately jumps to the editorial concern that this represents over diagnosis and overmedication by physicians pressured by parents and influenced by the pharmaceutical industry. It's at the most stressful times of the school year — like during exam periods — that strategies to relieve academic pressure mean the most. And recent research is shedding light on an effective way for schools to help manage students' stress: mindfulness, a mental practice that aims to develop greater awareness of thoughts, feelings and bodily sensations. Students can experience learning loss when they do not engage in educational activities during the summer months. On average, students lose the equivalent of two months of math and reading skills during the summer months. More than half of the achievement gap between lower- and higher-income youth can be explained by unequal access to summer learning opportunities. Arts educators have for years been telling school reformers obsessed with reading and math that the arts teach valuable skills and ways of thinking that can help academics. Here cognitive scientist Daniel Willingham writes about a study that shows a link between music training and reading. Willingham is a professor and director of graduate studies in psychology at the University of Virginia and author of "Why Don't Students Like School?" His latest book is "When Can You Trust The Experts? How to tell good science from bad in education." This appeared on his Science and Education blog. Many of our kids look forward to summer all year: Besides the escape from the daily grind of classroom life, these warm months promise fun with camps, family trips, outdoor play, and more filling our family schedules. While every summer has its fun times, we've all witnessed the other side of large amounts of unstructured time — bored kids (wailing "There's nothing to do!" every few minutes) who may be losing academic ground over these school-free months. Summer reading programs are often promoted by libraries as a fun way to prevent summer learning loss and keep kids productive while school is out of session. Students with disabilities will be able to use read-aloud accommodations on the English/language arts portion of the common core tests, with no requirement that they be virtually unable to read printed text or be at the beginning stages of learning to decode, according to an accommodations manual approved by the governing board of the Partnership for Assessment of Readiness for Colleges and Careers. The United States spends more than other developed nations on its students' education each year, with parents and private foundations picking up more of the costs, an international survey released Tuesday found. Despite the spending, U.S. students still trail their rivals on international tests. The Organization for Economic Cooperation and Development — which groups the world's most developed countries — writes in its annual report that brand-new and experienced teachers alike in the United States out-earn most of their counterparts around the globe. But U.S. salaries have not risen at the same pace as other nations. If teachers don't believe in kids with learning disabilities, who will? Tammie Schrader, a contributor for Take Part, writes: "My first experience teaching a special education class was not as positive as I had hoped. I was given eight students and I thought the class would be individualized, collaborative, and progressive. What an eye opener that turned out to be! The reality was that these eight students were not well-mannered. Working with them was very difficult, so about half way through the class, I stopped trying to give instruction and decided to just talk to them about their experience in the special education program." A human-like robot that can mimic emotions and play interactive games can help students with autism develop social skills. Aldebaran Robotics' "ASK NAO" robot, which is about two feet tall, mimics an emotion with gestures and sounds, and waits for children to recognize the emotion. It may then ask children the last time they experienced such an emotion. It also can teach autistic children time, taking turns, basic conversation and other communication skills. Just a few years ago, school districts around the country were slashing summer classes as the economic downturn eviscerated their budgets. Now, despite continuing budgetary challenges, districts are re-envisioning summer school as something more than a compulsory exercise where students who need to make up lost credits fight to stay awake inside humid classrooms. According to the National Summer Learning Association, a nonprofit group, 25 of the country’s largest school districts — including Charlotte, N.C.; Cincinnati; Oakland, Calif.; Pittsburgh; and Providence, R.I. — have developed summer school programs that move beyond the traditional remedial model. When Steve Walker was diagnosed with dyslexia in the third grade, he didn't understand how it made him learn differently than his classmates. Walker recalled how his childhood friends whizzed through academic tests, while he grew frustrated and discouraged, despite how hard he tried. The teachers and adults in Walker's life referred to his dyslexia as a disability and treated it as such, he said in an interview. While dyslexia is a disability according to the law, Walker said he prefers to think of it as a series of weaknesses and strengths that are specific to the individual. As charter schools continue to proliferate across the country, a new study finds that they are offering benefits for students with disabilities. In a report, the Center for Research on Education Outcomes at Stanford University compared the performance of students at charters with that of students attending traditional public schools in 25 states, the District of Columbia and in New York City. The analysis is an update to a similar report issued in 2009. Overall, the study finds that charters are improving, particularly when it comes to often-underserved groups like poor and minority students and those with disabilities. As the school year wound down, our daughter took state standardized tests. She didn't mind it — or so she told us. After all, she got to skip homework during testing week. School policy is for teachers not to assign homework so that students can relax and get plenty of sleep. All of this reminded me of my own middle and high school state testing experiences. Things weren't like they are today; we certainly didn't get a homework break.